The end of winter in Vermont means a welcome end to winter chores—and the beginning of spring chores. The most important spring chore, and the one we are famous for, is collecting maple sap and boiling it into maple syrup. We get started in mid-March, as soon as daytime temperatures rise above freezing and the sap starts flowing. We collect it and carry it to a sugar shack. There, it is boiled down in a big evaporator, usually wood-fired, that has to be tended day and night. Sugaring in Vermont is a hard job and few visitors actually witness it. Only the stubborn or determined will bog their vehicles down on muddy back roads in search of a rough-looking shed in the woods. 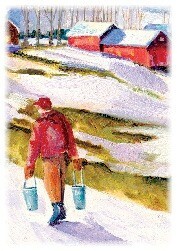 In 1947 our grandfather Vrest Orton wrote in this very catalog: “there is nothing sure about the Vermont maple season. One year may be a record year and the next a bust. 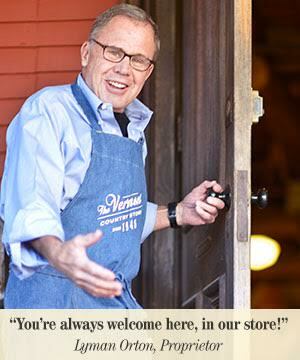 But one thing for sure is that Vermont maple syrup is not a commodity, it is a delicacy and a luxury and always will be”. That delicacy is a result of the process. You see, maple syrup isn’t just sugar. It has a luscious, complex flavor made of the minerals from the tree, caramelization from the fire, a hint of smoke from the wood fire, and a faint but essential forest ambrosia. 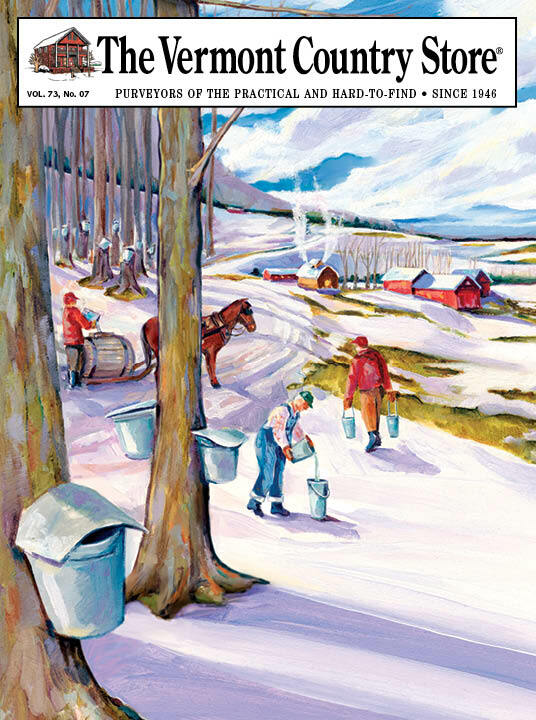 In the 1960s, our father Lyman Orton wrote about maple syrup again, with some passion, defending Vermont’s pure product against the proliferating “breakfast syrups” made from corn sugar, artificial flavor and food coloring. If these poor imitations are all you’ve ever poured on your pancakes, you really must try 100% pure Vermont maple syrup. Once you have, we promise you will never go back to the cheap stuff. For generations we have been proud to offer the world’s finest 100% pure Vermont Maple Syrup. It is a tradition worth passing on to your loved ones. Posted in Seasonal Activities, Seasons.